It is also equivalent to the carbon sequestration effect of growing 1 800 000 trees for ten years. Celebrating the programme’s ten-year anniversary, we held a competition for our employees. We asked them to create a personal message on how they have made use of the programme and to provide a photograph, video or other illustration. In April, I injured my knee playing football for the Swiss Re team. 1st diagnostic: surgery. 2nd option: get the leg very strong and avoid surgery. Thanks to the COyou2 Programme I bought a new bike … The result: I avoided the surgery. On average, I do three weekend trips per month, covering more than 200 km on each. Of course, I also go to the office by bike. Since yesterday, we have been proud producers of clean energy. 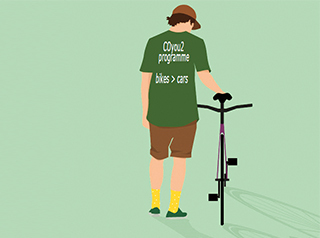 COyou2 has supported me and (indirectly) my small family in our aspiration to live without a car. 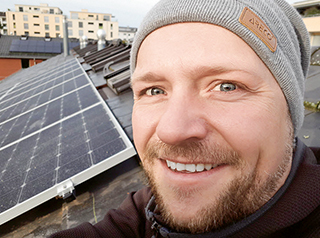 Besides being more environmentally friendly, we were also able to save up some of our own money, which we have now invested in harvesting the power of the sun. A big THANK YOU from myself, my wife and my little daughter who will hopefully grow up in a more sustainable future.